With Florida being home to more than 350 species of wildlife, it's doubtful that you'll be able to see all of them on just one airboat ride. However, while touring on Lake Cypress, you can do your best to spot several of the 80 different species of wildlife that live in or around our place. 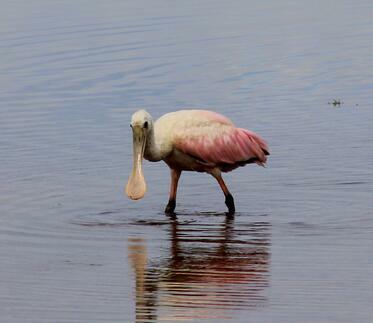 Here's a sampling of species (21, to be exact) that you can see on Everglades airboat tours. As the name suggests, this creature is native to and has only ever been found in the Florida Everglades. These salamanders are found in freshwater marshes and look like small eels. They have two feet but lack hind legs. While these are sometimes spotted around the Florida Everglades, they are more commonly found in the Florida Peninsula... hence the name! 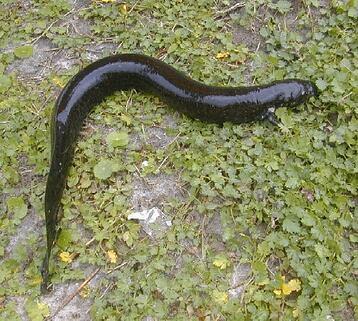 They’re usually dark olive, brown or black, and are about four inches long, half of that being tail. 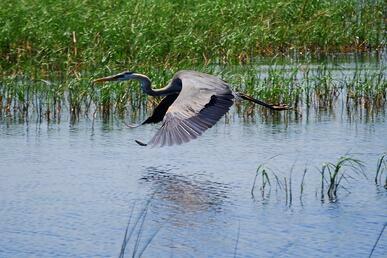 Anhingas are large, dark water birds with a long, slender neck and a long, sharp, serrated bill. They prefer coastal areas, marshes and mangrove swamps where they can hunt slow-moving fish and other aquatic prey underwater. Believe it or not, you don't have to travel to a national park to see our nation's official bird. 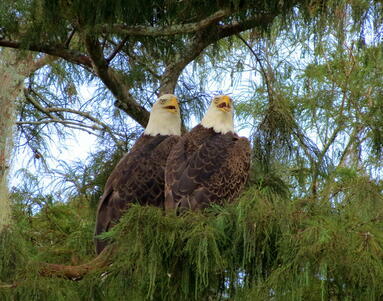 Florida has the second largest population of bald eagles next to Alaska. Bald eagles typically call "home" wherever they can catch the most fish. And with Florida containing more than 30,000 lakes that cover over 3 million acres of land, it's safe to say they don't have too much trouble finding a home (with some food nearby). As oneof Florida's most commonly seen large birds, these birds have become comfortable around people, and are sometimes spotted begging for human food. You can distinguish them from other common Florida birds by their blue-gray color, large yellow bill and black stripes above their eyes. This is the largest white heron in Florida, measuring up to three feet tall when fully grown (not to be confused with the aforementioned great blue heron, which is white until reaching full maturity). You can often find them in shallow wetlands, salt marshes or on the edges of a lake strolling through the shallows picking off fish and frogs. You might be familiar with the turkey when it's on the dinner table during Thanksgiving, but have you seen these guys out in the wild? Turkeys are large birds, distinguishable by their red-colored face and neck, that you can catch walking through the woods. Distinguished by their rose-pink feathers and spoon-shaped bill, the roseate spoonbill is one of Florida's more colorful native birds. You will sometimes find them in shallow waters, sweeping their broad bill in a side-to-side motion, searching for invertebrates, small fish, mollusks and other small prey. 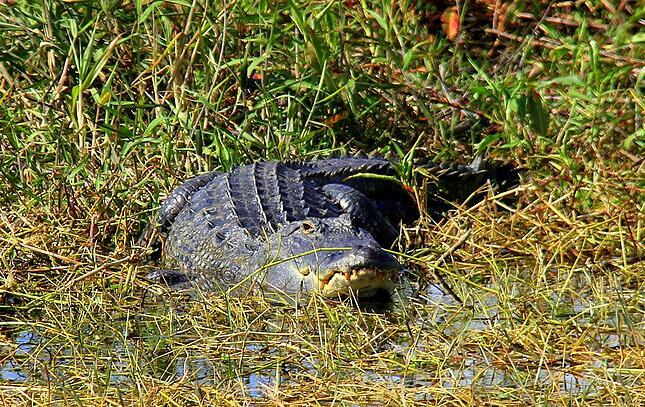 Found only in the southeastern portion of the United States, the most alligator-populated areas are in the marshes of Florida and coastal portions of Louisiana. Despite the average alligator measuring between 11 to 13 feet when fully grown, these creatures can be quite elusive, hiding among the marsh or underwater. Knowing when alligators are most active and reading a few wildlife spotting tips can help you to snag a picture of these beasts! While it may be tricky to tell the difference between an alligator and a crocodile, one of their most distinguishable features is right on the tip of their nose... literally! While alligators' noses are more broad and rounded, the American crocodile's nose tends to be longer and more pointed. Another feature that might help you distinguish these two from one another is the fact that the American crocodile will often bask in the sun with its mouth open, a behavior rarely seen in American alligators. Native to Cuba, the Bahamas and the Cayman Islands, these little guys have been introduced to Florida and can be found in fallen leave piles (primarily at night, as they are nocturnal!). They are distinguished by their olive-brown color, with two broad stripes running down their back, paler undersides and red eyes. 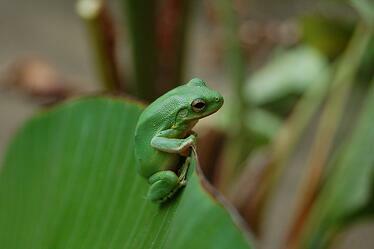 Similar to a chameleon, treefrogs (including green treefrogs) are able to change color. Green treefrogs are normally bright green, but when stressed or cold, they can turn dark olive-brown or charcoal colored. While it may be a bit difficult to see them, you will definitely hear their scratchy croak, often during rainstorms. One of the smallest toads in the United States, with a maximum length of 1.5 inches, you can distinguish this toad from others based on its gray complexion with yellowish stripes down the center of the back, along with three to four pairs of light-edged dark spots. Found primarily in sand pine scrub and dry hammocks, you might be able to hear their soft "Cheep, cheep, cheep" when stopped near the edge of Lake Cypress. 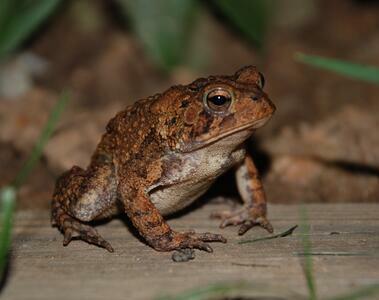 Because of their warty, dry looking skin, the southern toad is able to live in relatively dry habitats. Many Floridians have probably seen them often, as they are commonly found in yards, gardens and near porches and street lights. You can distinguish this toad from others by two large ridges between the eyes that end as knobs behind the eyes. Named after their short tail, bobcats are medium-sized cats that are known for being great hunters. Hunting primarily at night, bobcats are able to take down animals ranging in size from mice to deer! Along with their short tail, you can spot a bobcat based on its white underside with dark bands on top and black ears. If you miss out on seeing one on your airboat ride, you can catch them up close when you stroll through our Gator and Wildlife Park! 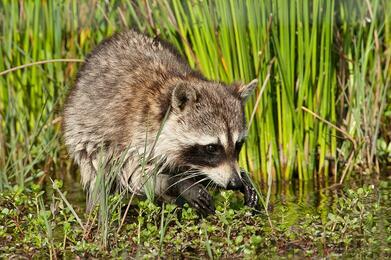 Commonly found throughout Florida, raccoons are about the size of a large house cat. They are distinguished by their bushy tails marked with four to seven alternating brown and black rings and a black facial "mask." They are one of Florida's most common urban animals, often seen around campsites, parks and in neighborhoods raiding garbage cans. Similiar to gray foxes in their size and weight, and averaging about 7 to 11 pounds, there are more differences between red foxes and gray foxes than the color of their fur. As opposed to their gray counterpart, red foxes prefer living on the edges of forests, meadows and open pastures. So if you're lucky, you might be able to spot one on the edge of the woods that surround Lake Cypress. 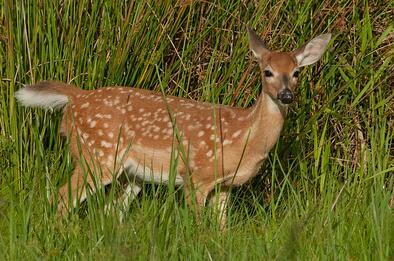 White-tailed deer live in almost every habitat type in Florida but tend to live in dense forests or on the edge of forests. Mainly grazers, white-tailed deer often feed on leaves, twigs, grass, and herbs throughout the night. Thanks to colonial traders and immigrants introducing pigs to Florida in 1539, Florida is one of the earliest states to have a feral pig population. 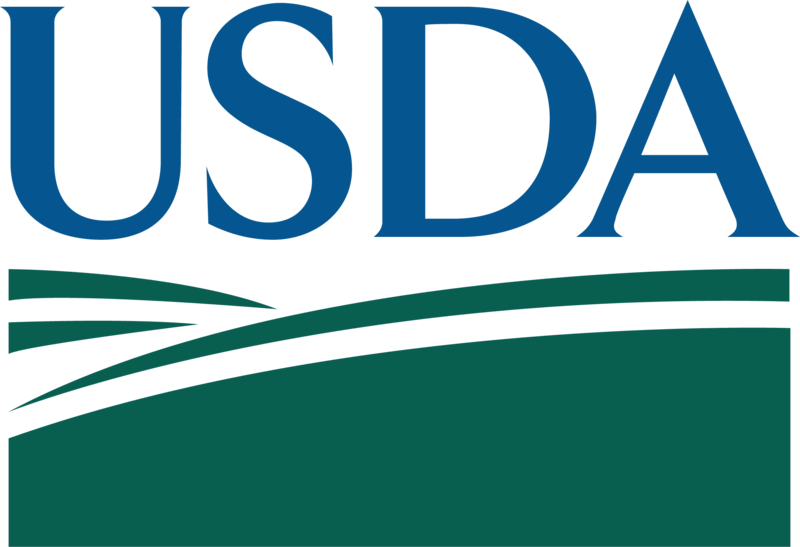 As omnivores, wild pigs are known to feed on nuts, mushrooms, fruits, snakes, frogs, eggs, and insects. You can often tell when a wild pig has been looking for food when you see a small patch of land recently rooted or plowed. 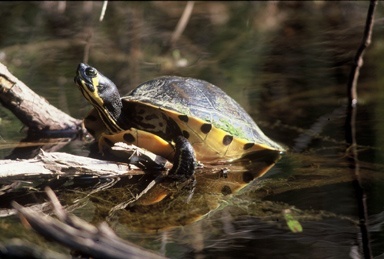 Found in rivers and large streams, the Florida cooter is one of the most frequently seen turtles in the state's waterways. Growing up to a max of 15 inches, you can distinguish Florida cooters based on their dark olive-brown shell that has bright yellow markings on each plate, along with yellow stripes on the turtle's head, neck, and feet. Reaching a maximum length of 20 inches, the Florida softshell turtle is distinguished by its long neck, narrow head, and slender snorkel-like nose, with flipper looking feet and soft shells that feel like leather. You can mainly spot them floating on the surface of lakes and ponds, often covered with algae and other aquatic vegetation. Excited to see these beauties for yourself? 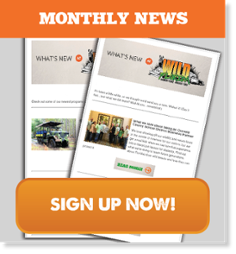 Book your Orlando airboat ride at Wild Florida through the link below to save your seat for an unforgettable ride through the headwaters of the Everglades. Make sure to charge your camera battery so you can capture all these animals and more on your airboat ride, along with walking through our Gator and Wildlife Park!